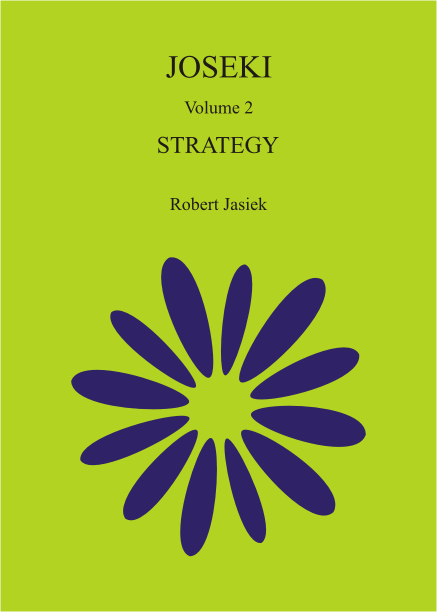 The author and publisher of Joseki / Volume 2: Strategy is Robert Jasiek. The book is of A5 size, has 272 pages, has 3 diagrams per page on average, is written for players from 18 kyu to 7 dan and has the suggested price EUR 26.5 (book) or EUR 13.25 (PDF). The famous proverb "Study joseki to become two stones weaker!" contains a spark of truth: It is useless or even counter-productive to learn a dictionary's variations by heart and apply them without understanding and regardless of the positional context. Contrarily, the key to becoming much stronger lies in good understanding of general theory and evaluation of the position, that is strategy and analysis methods. As a reader of Go books, the author has been disappointed about the rarity of strategy books teaching more than one aspect of strategy and more than a few principles. At the same time and in comparison to books teaching by examples only, he did learn a hundred times as much from those books explaining at least about half a dozen of strategic concepts in general. The author's plan was born: a strategy book covering all aspects of strategy with the by far most complete collection of generally valid principles, concepts and methods. This book fulfils his dream! Joseki / Volume 2: Strategy is written with the clear intention of making many serious readers significantly stronger. most profound and complete explanation of the strategic concepts Cut, Efficiency, Influence, Thickness, Stability, Investment, Playing Elsewhere, Mobility and Timing and of 7 aspects of the analysis method Tewari. The book serves the two purposes of teaching joseki strategy in particular and strategy in general. While the majority of examples shows josekis or other corner situations and only some examples illustrate the middle game, almost all principles, concepts and methods are equally applicable during opening and middle game. Besides introduction and index, the book's top level structure consists of the major strategic aspects: strategic objects, strategic concepts, analysis methods, strategic lines, strategic choices, group meanings and strategic planning. The almost trivial chapter Strategic Objects is a very short preparation for the later chapters, in which strategic objects (dynamically studied groups of stones, strings or intersections) are studied or occur in some principles. Strategic Lines (the sequences' moves having the same major meaning) and Group Meanings are two comparatively simple and fundamental chapters in the spirit of Volume 1. If one has not studied josekis in great detail yet, then the construction of many variations remains a mystery. Knowing the possible meanings (such as a player's construction, restriction of the opponent's development, fight and temporary actions) of related moves or groups can turn on the light in an instant when the structure of josekis becomes evident. The book's cover can be seen as a metaphor for the power of simplicity reflected in these chapters. In general, the potential of strategy is its great reduction of decision complexity. The final chapter Strategic Planning gives general advice how to combine and apply the earlier chapters' theory to whole board examples. The chapters Strategic Concepts, Analysis Methods and Strategic Choices form the book's core. Although it explains everything that is new and above an 18 kyu's level of knowledge and it is written for players of all stronger ranks, the book has both its easy and its advanced chapters. Some kyu players might prefer to postpone reading the most difficult chapters while readers interested in such theory, dan players and professionals can enjoy the author's recent discoveries. The aforementioned top level chapters have the concepts, methods or choices as their second level. Some meticulously studied topics can have a third level, which studies the flavours of a topic. The basic structure within each chapter starts with general theory in bold font, proceeds with its detailed explanations in ordinary font and finishes with examples. Typically, easy chapters have shorter explanations and fewer examples while difficult chapters have longer explanations and more examples. Particularly difficult chapters are preceded by preliminary chapters and, as far as possible, contents applied in later chapters is treated in earlier chapters. Therefore reading the book from the beginning to its end is the natural strategy, although selective reading is also possible and supported by the index and difficult chapters could be skipped during the book's first reading. Different kinds of general theory occur: principles, definitions, methods and values. The principles give general advice how to play ("Count threats before starting a ko! "), which kinds of moves to choose ("A player chooses no fight and simplicity if he is ahead.") or which purposes of application a concept (such as 'timing') has ("An aim delayed until about the last moment can preserve additional ko threats."). Definitions are not arbitrary descriptions but try to be both clear and as precise and general as possible. For example, the strategic concept 'investment' is not only explained but even defined: "A player's 'investment' in a set of nearby groups consists of his stones added or sacrificed there since the previous stable state and until the next stable state." Now the reader can understand easily that an investment must be fulfilled by making his groups stable again before playing elsewhere. Methods are step by step procedures used for evaluation of the position. Most of the methods consist of just two or three steps - simple and powerful. The Unsettled Group Average method for dan players is the exception because two formulas are needed to determine the average values of a move and a local position's count. Other values introduced in the book are simpler. For example, overconcentration can be measured by the Territory Efficiency, which divides territory points by the number of stones played to achieve it. With little effort, everybody can improve quickly: It is very easy to understand that about 2 points per stone are better than 1 point. The book provides many simple principles and tools for greatly easing decision making. The chapter Strategic Concepts explains connection, cut, gote, sente and initiative, aji, efficiency, influence, thickness, stability, urgency, investment, playing elsewhere, options, flexibility, mobility, forcing, haengma, timing and so on. If the reader wonders whether anything is missing - yes: the strategic concepts sacrifice, exchange, reduction and invasion could not get extra chapters and will be topics of later books on the middle game. The range of difficulty varies from easy (like connection) via intermediate (like timing) to advanced (like thickness). While the easy concepts can be understood immediately, the intermediate concepts require learning of one or two dozen of principles or a method for deciding about playing elsewhere called Unrest Model, which demands the player's ability to count to 2. The author believes that such simple methods prevail because they can be applied during one's games regardless of the pressure of short available thinking time. Influence and thickness are as easy or difficult as the reader chooses: Explanations start with the easiest models, continue with more general models requiring a bit more effort (to verify whether stones are connected and alive) and culminate in the most precise definitions of these concepts ever. In the related chapters, the regular player can choose to read half of the pages and skip the other half. Dan players, professionals and players interested in a formal model will enjoy the generalisations of connection, life and territory, which study how often a player can play elsewhere while the opponent already starts to attack. Although this is not more difficult than judging whether an opposing move threatens something, a regular application of the generalised concepts requires much reading. Assessing the exact quality of influence or thickness behaves like solving a life and death problem. While advanced players are enabled to replace "This move is good, believe me!" descriptions by carefully justified objective explanations, kyu players might prefer to apply the easier, less precise models. The chapter Analysis Methods starts with the most basic quiescence and counting territory in quiet positions. After the chapter about evaluating unsettled groups, positional judgement evaluates the position. While global positional judgement studies territory, thickness, mobility, strategic choices and so on, local positional judgement assesses both territory and (surprise!) territorial values of influence. Although the latter cannot always be determined precisely, the reader profits from the results of the author's new research made for the sake of writing this book. The tewari chapter is the most complete but still very easy to understand treatise on this topic in English literature. Books teaching strategic choices only by means of examples are occasionally seen. This book raises the level by presenting both the relevant general principles and examples for the following decisions: "Sente or gote? ", "Which strategic plan to follow? ", "Which direction to choose? ", "Which kind of local development? ", "Which cut to play or protect?" and "What to sacrifice?" The book is filled with so much invaluable theory and examples explaining it that space for problems is missing. Another thing is missing but scheduled for Volume 3: a more dictionary-like discussion of many variations. Volume 2 has only some full joseki move sequences where they occur in the context of a strategic topic's example. While the book teaches joseki understanding and strategic embedding in the positional context, the author recommends to read it in conjunction with a tactically orientated dictionary or selection. Learning joseki well requires both views: strategy and tactics. Since Joseki / Strategy fills the topic's major gap in literature, reading it is essential. See review by John Fairbairn.